The PHH-720 model has been discontinued. Please see the PHH103B as a possible alternative or contact our Flow Engineering department. 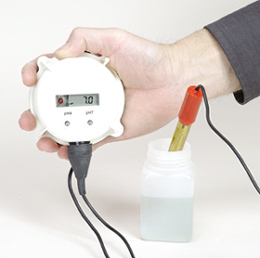 The PHH-720 is a water-resistant pH meter with a built-in 3½-digit LCD. The meter is supplied with the PHE-720 double-junction, plasticbody, gel-filled combination pH electrode with 2 m (6.6') cable and BNC connector protected by a waterproof sheath. The electrode has a unique clogging-resistant PTFE diaphragm. The alarm setpoint can be selected anywhere in the 3 to 11 pH range. A red LED warns the user in the event the reading is outside the setpoint by more than ±0.5 pH. Calibration can be manually performed at 1 or 2 points through two easily accessible trimmers on the front of the unit. The meter is suited for outdoor installations and highly humid environments. The casing has also been specially designed to give maximum stability and prevent rolling from any surface. In addition, a molded hook allows the meter to be easily installed close to the sample. The 12 Vdc power supply is ideal for continuous monitoring over extended periods of time. PHH-720 is supplied complete with pH electrode, calibration key, power supply and instructions. 참고: Comes complete with pH electrode, calibration key, power supply, and operator’s manual.